Authored by mglb on Feb 4 2019, 8:05 PM. Fix bold lines (BUG 402415). Make line width proportional to font size. Move relevant code to separate file and namespace. Remove code for checking supported line characters from Character class. Information about what is supported is now in one place together width drawing code. 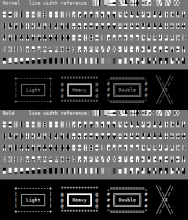 Remove fontembedder/LineFont files (no longer used). Add test script for displaying supported characters table. Add triple and quadruple dashes (U+2504...U+250B). 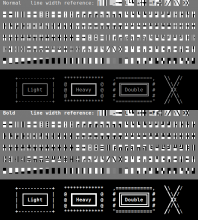 Change shade block characters (U+2591...U+2593) look. 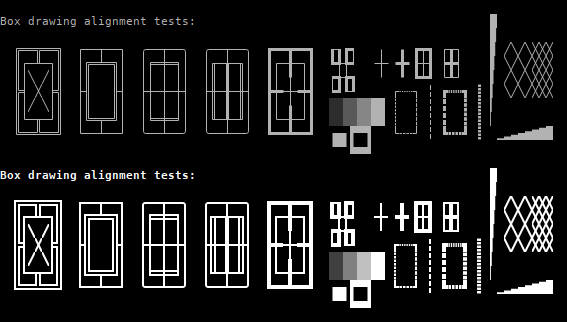 When antialiasing is turned on, shades are drawn as transculent solid rectangles with 25%, 50% and 75% alpha. This matches the characters name/description and their usage. Without antialiasing, previous method with patterns is used. Open Edit Current Profile → Appearance. Turn on Draw intense colors in bold font. Turn off Use line characters contained in font. 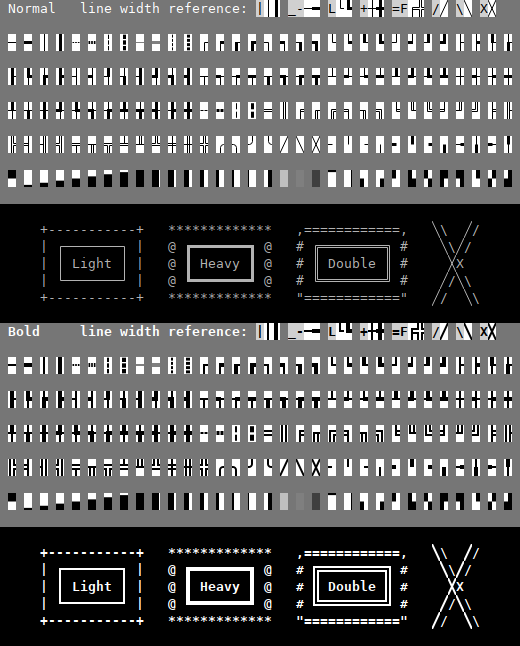 (Optional) select a font which is able to display bold characters in Konsole (e.g. 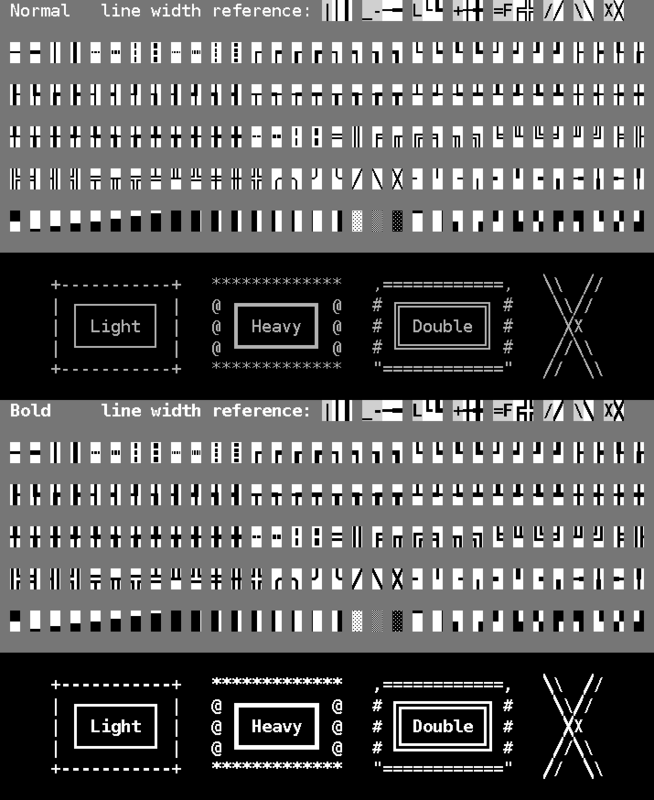 DejaVu Sans Mono). 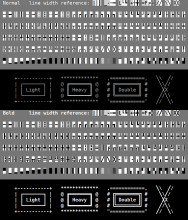 By switching Use line characters contained in font on and off, compare built-in characters drawing with characters from a font. General shape and line directions must be the same. Small offsets, line width differences (as long as proportions between lines in a character are kept), and quality differences are allowed. 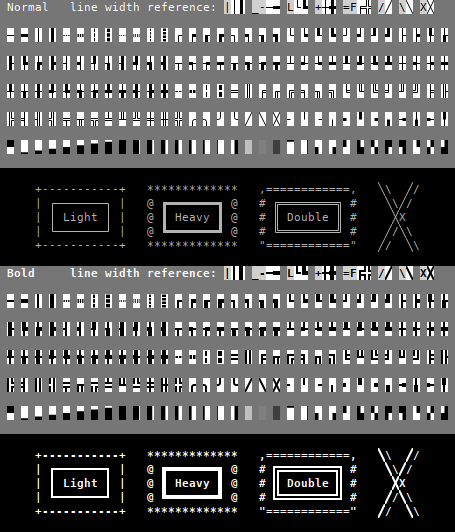 Review glyphs quality in different font sizes. Toggle Smooth fonts, review quality again. At the bottom of the file you can find a few alignment images. 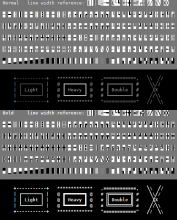 Check if all lines align properly. If you're unsure how it should look, compare it with font characters by turning on Use line characters contained in font option. Stray ';' - results in compiler warning. For fontWidth less than 8 this returns 1 for both bold and normal lines. Intentional? 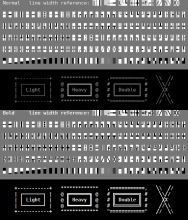 IMO increasing the LightWidthToFontSizeRatio to 1/5 is acceptable. AFAICT only this variant is actually used - so is the other one necessary at all? looks good in general to me. rotl is a pretty normal acronym, but probably more readable if it's called rotateBitsLeft or something? not a fan of two-letter abbreviated variable names (against the Qt code style fwiw). maybe a comment to show which is which? in case of future debugging. no idea what these types are, isn't the first one just a bool? auto feels unnecessary (and I'm allergic to auto). mglb retitled this revision from Improve built-in line/box characters drawing to Add line/block characters table for testing. 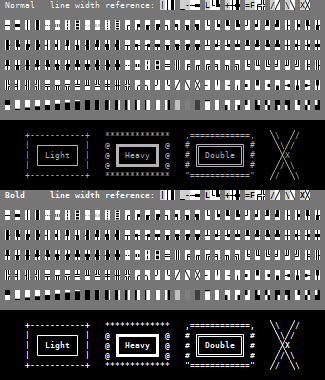 It now returns 1 for normal and bold lines when the fontWidth is less than 7. It is just not possible to fit bold characters in such narrow space. is now set to normal line width + 1, so it is always bolder for character widths >= 7.
mglb retitled this revision from Add line/block characters table for testing to Improve built-in line/block characters drawing. mglb marked 7 inline comments as done. The thing to do here is to store some values using getters, and restore them later using respective setters. const auto is nice in such cases - types are not important, as the variables should not be touched. However, there were no const, so this was not so obvious. Anyway, changed first one to bool. Speaking as user and downstream packager - this is a fairly important fix for a regression which got introduced in a bugfix release. It really makes sense to add this to the next possible release. OK slightly concerned about such big changes this close to a new release; but let's go with it for now. Actually, it doesn't merge now - can you rebase please? There's a krazy check that suggest this might be better using prefix due to efficient ( ie ++topIndex) - I haven't checked if this change would work here.